Polymicrobial biofilms, in which mixed microbial species are present, play a significant role in persistent infections. Furthermore, polymicrobial biofilms promote antibiotic resistance by allowing interspecies transfer of antibiotic resistance genes. In the present study, we investigated the effectiveness of antimicrobial blue light (aBL; 405 nm), an innovative non-antibiotic approach, for the inactivation of polymicrobial biofilms. Dual-species biofilms with Pseudomonas aeruginosa and methicillin-resistant Staphylococcus aureus (MRSA) as well as with P. aeruginosa and Candida albicans were reproducibly grown in 96-well microtiter plates or in the CDC biofilm reactor for 24 or 48 h. The effectiveness of aBL inactivation of polymicrobial biofilms was determined through colony forming assay and compared with that of monomicrobial biofilms of each species. aBL-induced morphological changes of biofilms were analyzed with confocal laser scanning microscopy (CLSM) and scanning electron microscopy (SEM). For 24-h old monomicrobial biofilms formed in 96-well microtiter plates, 6.30-log10 CFU inactivation of P. aeruginosa, 2.33-log10 CFU inactivation of C. albicans and 3.48-log10 CFU inactivation of MRSA were observed after an aBL exposure of 500 J/cm2. Under the same aBL exposure, 6.34-log10 CFU inactivation of P. aeruginosa and 3.11-log10 CFU inactivation of C. albicans were observed, respectively, in dual-species biofilms. In addition, 2.37- and 3.40-log10 CFU inactivation were obtained in MRSA and P. aeruginosa, dual-species biofilms. The same aBL treatment of the biofilms developed in the CDC-biofilm reactor for 48 h significantly decreased the viability of P. aeruginosa monomicrobial and polymicrobial biofilm when cocultured with MRSA (3.70- and 3.56-log10 CFU inactivation, respectively). 2.58-log10 CFU inactivation and 0.86-log10 CFU inactivation was detected in MRSA monomicrobial and polymicrobial biofilm when cocultured with P. aeruginosa. These findings were further supported by the CLSM and SEM experiments. Phototoxicity studies revealed a no statistically significant loss of viability in human keratinocytes after an exposure to 216 J/cm2 and a statistically significant loss of viability after 500 J/cm2. aBL is potentially an alternative treatment against polymicrobial biofilm-related infections. Future studies will aim to improve the efficacy of aBL and to investigate aBL treatment of polymicrobial biofilm-related infections in vivo. Microorganisms are prone to forming biofilms, surface-associated microbial communities that are extremely resistant to antimicrobials and the immune system (Costerton et al., 1999). Moreover, biofilm-forming microorganisms are far more resistant to antimicrobials than organisms in suspension (Dunne, 2002). It is reported that biofilms are involved in up to 65% of infections where they often lead to severe illness with a prolonged hospital stay, increased costs, and high mortality (La Fuente-Núñez et al., 2014). Most diseases have previously been characterized as monomicrobial in nature, likely due to the extensive use of culture-dependent isolation techniques. Now, with the advent of culture-independent analysis methodologies, several are becoming increasingly recognized as polymicrobial infections (Peters et al., 2012). Polymicrobial biofilms, in which mixed microbial species are present, are the dominant form of microbial life in nature (Harriott and Noverr, 2011; DeLeon et al., 2014). By including mixed microbial species in a single community, biofilms obtain numerous advantages, such as an enlarged gene pool with more efficient DNA sharing, quorum sensing systems, passive resistance, metabolic cooperation, and many other synergies (Wolcott et al., 2013). For instance, the gram-negative pathogen Pseudomonas aeruginosa is commonly found in mixed infections with the polymorphic fungus Candida albicans or the gram-positive bacterium Staphylococcus aureus (Harriott and Noverr, 2011; DeLeon et al., 2014). As such, P. aeruginosa and C. albicans are often found together in burn wound infections, contaminated catheters and chronic lung infections (Peleg et al., 2010). P. aeruginosa and S. aureus, on the other hand, have frequently been isolated from chronically infected wounds, chronic suppurative otitis media, indwelling medical devices, abnormal airways such as those in cystic fibrosis and other chronic obstructive lung diseases (Yadav et al., 2017). P. aeruginosa can attach to the surface of C. albicans hyphae (but not yeast cells) and form dual-species biofilms (Peleg et al., 2010). Interspecies competition between P. aeruginosa and C. albicans enhances the production of virulence factors and increases mutability, and thus can alter the course of host-pathogen interactions in polymicrobial infections (Peleg et al., 2010; Trejo-Hernández et al., 2014). As a result, dual-species biofilms with P. aeruginosa and C. albicans play extensive roles in nosocomial infections and infection in immunocompromised individuals (Fourie et al., 2016). S. aureus and P. aeruginosa are two versatile bacterial pathogens that are frequently found together in chronic wound infections (Stacy et al., 2016). Dual S. aureus and P. aeruginosa infections are more virulent and/or result in worse outcomes than the single infections caused by either species. The mutualistic and parasitic interactions drive the synergistic impact of the two species on the progression of infections (Nguyen and Oglesby-Sherrouse, 2016). Effective therapy for tackling the antimicrobial resistance in polymicrobial biofilms is lacking. There is a pressing need for the development of new strategies against polymicrobial biofilm infections. Antimicrobial blue light (aBL) in the spectrum of 400 to 470 nm, as an innovative light-based non-antibiotic strategy, has attracted increasing attention due to its intrinsic antimicrobial effect without the involvement of exogenous photosensitizers (Dai et al., 2012; Wang et al., 2017; Gwynne and Gallagher, 2018). The proposed mechanism of action of aBL involves the natural accumulation in microbial cells of photoactivable metal-free porphyrins such as uroporphyrin, coproporphyrin, and to a lesser extent protoporphyrin (Dai and Hamblin, 2017). These endogenous porphyrins absorb the Soret band of light (405–420 nm) and are subsequently excited to the triplet state, where singlet oxygen is generated (Dai et al., 2012; Dai and Hamblin, 2017; Wang et al., 2017; Gwynne and Gallagher, 2018). Singlet oxygen rapidly reacts with a wide range of cellular macromolecules and damages proteins, lipids, DNA, and RNA (Glaeser et al., 2011; Bumah et al., 2017). Additional mechanisms of action such as prophage activation have also been proposed (Yang et al., 2017). Similar to antimicrobial photodynamic therapy (Dai et al., 2009), aBL inactivation of microorganisms is thought to be a multi-target damaging process (Maisch, 2015). As a consequence, the likelihood for the development of aBL-resistance by microorganisms is less than that of antibiotic resistance. In the present study, we investigated the effectiveness of aBL inactivation of polymicrobial biofilms in vitro. Monomicrobial and polymicrobial biofilms of P. aeruginosa, S. aureus and C. albicans were reproducibly grown in 96-well microtiter plates or the CDC biofilm reactor. The effectiveness of aBL inactivation of polymicrobial biofilms was determined through colony forming assay and compared with that of the monomicrobial biofilms of each species. Furthermore, the morphological changes of biofilms induced by aBL were analyzed with confocal scanning microscopy (CLSM) and scanning electron microscopy (SEM). For aBL irradiation, we used a light-emitting diode (LED) with peak emission at 405 nm and a full width at half maximum (FWHM) of 20 nm (M405L3, Thorlabs, United States). The irradiance on the surface of the target was measured using a PM100D power meter (Thorlabs). The distance between the LED aperture and the target was set at 3 cm for 92.6 mW/cm2 and 4 cm for 60 mW/cm2. The radiant exposure was calculated with the following equation (Radiant exposure (J/cm2) = Irradiance (W/cm2) × Exposure time (s)). The strains used in this study were P. aeruginosa IQ0046 (a clinical multidrug-resistant isolate) (Lu et al., 2018), C. albicans CEC 749 (Enjalbert et al., 2009), and MRSA USA300 (Vidlak and Kielian, 2016). These strains were routinely grown at 37°C and 150 rpm in Brain Heart Infusion (BHI; BioMerieux, France) broth or BHI supplemented with 15 g/L agar. C. albicans, MRSA and P. aeruginosa were grown overnight in BHI broth. Then, the cell densities of the suspensions were adjusted to approximately 106 CFU/mL for MRSA and P. aeruginosa and 105 CFU/mL for C. albicans, and 100 μL aliquots were inoculated in 12 wells of 96-well microtiter plates (Wang et al., 2016). After 24 or 48 h of incubation (with renewal of the media every 24 h), the biofilms were carefully washed two times with phosphate-buffered saline (PBS; Thermo Fisher Scientific, United States). Then, three wells of untreated biofilms were scraped and pooled together with a sterile pipette tip and this procedure was repeated twice with fresh PBS and in two technical replicates. The biofilms in the other 6 wells were irradiated with aBL at exposures of 216 J/cm2 (60 mW/cm2, 60 min) or 500 J/cm2 (92.6 mW/cm2, 90 min) and the scraping procedure was repeated after aBL exposure. The total volume obtained, 600 μL, was sonicated for 5 min and the samples were diluted and processed for colony counting. The experiments were performed in triplicates for each condition. The dual-species biofilms with C. albicans and P. aeruginosa were formed by mixing 105 CFU/mL of C. albicans and 106 CFU/mL of P. aeruginosa in 12 wells of a 96-well microplate; and the dual-species biofilms with MRSA and P. aeruginosa were obtained by mixing 106 CFU/mL of each species. After 24 or 48 h of incubation (with renewal of the media every 24 h), the biofilms were exposed to 216 J/cm2 (60 mW/cm2, 60 min) or 500 J/cm2 (92.6 mW/cm2, 90 min) aBL, collected and sonicated. To enumerate the CFUs, sonicated dual-species biofilms with C. albicans and P. aeruginosa were plated on BHI agar supplemented with chloramphenicol (Sigma-Aldrich, United States) for the selective growth of C. albicans or with amphotericin B for the selective growth of P. aeruginosa (Clinical and Laboratory Standards Institute et al., 2002, 2011). The sonicated dual-species biofilms with P. aeruginosa and MRSA were plated on BHI agar supplemented with colistin for selective growth of MRSA or vancomycin for selective growth of P. aeruginosa. Growth recovery on selective growth media was compared with growth recovery on a general medium (BHI without antibiotics). Three independent experiments were performed for each condition. To ensure thermal effect was not involved in killing microorganisms, the temperatures of the samples were monitored using a Traceable® Type K thermocouple (Thermo Fisher Scientific). Biofilms of P. aeruginosa, MRSA and C. albicans were also developed under dynamic shear conditions using the CDC biofilm reactor (model CBR 90–1 DH, BioSurface Technologies Corporation, United States) as described elsewhere (Sánchez-Gómez et al., 2015; Fernández-Rivero et al., 2017). Briefly, 400 mL BHI (37 g/L) were inoculated at 37°C with 1 mL of an overnight culture of the microorganisms and incubated in the biofilm reactor with 150 rpm stirring. The dual-species biofilms with C. albicans and P. aeruginosa or with MRSA and P. aeruginosa were formed by inoculating the CDC biofilm reactor with 1 mL of each one of the strains. After 24 h, a constant flow of 10 mL/min BHI (3.7 g/L) was stablished and dense biofilms (107–108 CFU/cm2) were developed on the surface of small disks called coupons. After 24 h of further incubation under continuous flow (i.e., 48 h of incubation in total), coupons were removed from the chamber and planktonic cells were eliminated by rinsing with 1 mL sterile PBS. Then, coupons were immersed in 4 mL of sterile PBS in 3.5-cm petri dishes and irradiated using aBL with exposures of 216 (60 mW/cm2, 60 min) or 500 J/cm2 (92.6 mW/cm2, 90 min) and processed for colony counting. For enumerating CFU, the biofilms were detached by scraping the coupon surface with a sterile wooden stick. Then, biofilm cells were suspended in 3 mL PBS and homogenized by 5 min of sonication (Bransonic 2510R-MT, United States) and vortexing (Thermo Fisher Scientific, United States). The aliquots were serially diluted, plated for CFU counting, and the cell densities in log10 CFU/cm2 of the biofilms attached to the coupons were calculated. In turn, the calculated cell densities in log10 CFU/cm2 allowed the determination of log10 CFU inactivation, which was defined as the logarithm of the ratio of the CFU/cm2 post-aBL exposures to the CFU/cm2 of the untreated control. For the enumeration of CFU in the dual-species biofilm populations, sonicated samples were plated on BHI agar supplemented with chloramphenicol or amphotericin B for selective growth of C. albicans or P. aeruginosa; and on BHI agar supplemented with colistin or vancomycin for selective growth of MRSA or P. aeruginosa as previously described. Growth recovery on selective growth media was compared with growth recovery on a general medium (BHI without antibiotics). Experiments were independently repeated three times in duplicate coupons and the temperatures of the samples were also monitored as previously described. Biofilm structure and microbial viability in biofilms were also visualized using CLSM. In brief, aBL-treated (500 J/cm2) and untreated monomicrobial and polymicrobial biofilms grown on the polycarbonate coupons of the CDC biofilm reactor were stained with SYTO 9 and propidium iodide (PI) (Invitrogen, United States). SYTO 9 is a dye that can diffuse through the membranes of microorganisms and stain DNA. On the other hand, PI can only penetrate the cells and dye DNA when the integrity of the membrane has been compromised. As a result, SYTO9 and PI work as an indicator of viability and death of microorganisms, respectively (Stiefel et al., 2015). However, PI can only be used for evaluating death of microorganisms when the membrane is damaged. In case bacteria are killed without membrane damage, death of bacteria may be understimated using this approach. After staining, the biofilms were examined with an Olympus Fluoview FV10i CLSM using the Alexa Fluor 488 nm and the 568 nm wavelength filters and the 10 × or 60 × objectives. Scanning electron microscopy was performed to investigate the morphological changes of biofilms induced by aBL treatment. Monomicrobial and polymicrobial biofilms were grown for 48 h in the CDC biofilm reactor and then exposed to 500 J/cm2 of aBL (92.6 mW/cm2, 90 min) or left untreated. After aBL exposure, the treated and untreated coupons were washed in PBS and fixed at 4°C for 24 h in 0.1 M sodium cacodylate buffer containing 2.5% glutaraldehyde, 0.15% alcian blue, and 0.15% safranin O. The fixed biofilms were washed three times for 10 min with 0.1 sodium cacodylate buffer, infiltrated with 1% osmium tetroxide for 1 h, washed another three times for 10 min with 0.1 sodium cacodylate buffer and dehydrated from 30, 50, 70, 85, 95, to 100% ethanol, spending 10 min in each solution and three consecutive exposures in the last concentration. Then, the samples were dried using a critical-point dryer, mounted on specimen stubs, sputter-coated with 8 nm platinum and examined using a high-resolution field emission SEM Hitachi S-4800. Micrographs were acquired under high vacuum using an accelerating voltage of 2.0 or 3.0 kV. To test the phototoxicity of aBL to normal human epithelial cells, a monolayer of HaCaT keratinocytes were exposed to aBL at varying exposures of 216 J/cm2 (60 min, 60 mW/cm2) and 500 J/cm2 (90 min, 92.6 mW/cm2) in a 35 mm petri dish. The viability of the cells was measured using Cell Counting Kit-8 (CCK-8) (Sigma-Aldrich) after aBL exposure. CCK-8 uses WST-8 2-(2-methoxy-4-nitrophenyl)-3-(4-nitrophenyl)-5-(2,4-disulfophenyl)-2H-tetrazolium, monosodium salt, which produces a water-soluble formazan dye upon bioreduction by cellular dehydrogenases. The absorbance was determined by the optical density at 450 nm (Molecular devices Emax). Data were presented as the mean ± standard error. The differences between conditions were analyzed with a one-way ANOVA followed by Tukey’s multiple comparison test (ns: not significant, ∗P < 0.05, ∗∗P < 0.01, ∗∗∗P < 0.001). After 24 h of incubation, the obtained monomicrobial biofilms consisted of 7.76 log10 CFU/mL of C. albicans, 8.62 log10 CFU/mL of MRSA and 8.87 log10 CFU/mL of P. aeruginosa. When C. albicans and P. aeruginosa were incubated together in dual-species biofilms for 24 h, the cell densities decreased to 6.97 log10 CFU/mL for C. albicans (ns, P = 0.159) but increased to 9.42 log10 CFU/mL for P. aeruginosa (ns, P = 0.534). In the 24-hour old dual-species biofilms with MRSA and P. aeruginosa, the cell densities were 8.59- and 8.16-log10 CFU/mL for MRSA and P. aeruginosa, respectively (ns, P > 0.99 and ns, P = 0.263) (Table 1), in comparison to the cell densities in the respective monomicrobial biofilms. Table 1. Effectiveness of antimicrobial blue light (405 nm) inactivation of biofilms grown in 96-well microtiter plates after 24 h of incubation. The effectiveness of aBL inactivation of the biofilms varied depending on the species. In monomicrobial biofilms, P. aeruginosa was the most susceptible to aBL with 6.30 log10 CFU reduction in 24-hour old biofilms after 500 J/cm2 aBL was delivered (P < 0.0001) (Table 1). Under the same aBL exposure, 3.48- and 2.33-log10 CFU reductions were observed in 24-hour old MRSA (P < 0.0001) and C. albicans biofilms (P = 0.0025), respectively. In the 24-hour old dual-species biofilms with P. aeruginosa and C. albicans, 6.34-log10 CFU reduction was observed in P. aeruginosa when an exposure of 500 J/cm2 had been delivered. (P < 0.0001; Table 1), which was almost the same extent of inactivation as in the monomicrobial biofilms. However, C. albicans became more susceptible to aBL than in the monomicrobial biofilm and 3.11 log10 CFU reduction was observed (Table 1; P < 0.0001). When the dual-species biofilms with P. aeruginosa and MRSA were exposed to 500 J/cm2 aBL, 2.37 log10 CFU reduction was observed in MRSA (P = 0.0019) and 3.40 log10 CFU reduction in P. aeruginosa (P < 0.0001) (Table 1). After 48 h of incubation, the cell density in monomicrobial biofilms increased in all species in comparison to that of 24 h old biofilms (Table 2). In the dual-species biofilms with P. aeruginosa and C. albicans, the cell density of P. aeruginosa increased while the cell density of C. albicans decreased when the incubation time was increased from 24 to 48 h (Table 2). In the dual-species biofilms with P. aeruginosa and MRSA, the cell density of both species increased slightly (Table 2). Table 2. Effectiveness of antimicrobial blue light (405 nm) inactivation of biofilms grown in 96-well microtiter plates after 48 h of incubation. After treatment with 500 J/cm2 aBL, the CFU reductions in the monomicrobial biofilms of each species were 2.11-, 2.35-, and 6.88-log10 for C. albicans (P = 0.0009), MRSA (P < 0.0001), and P. aeruginosa (P < 0.0001), respectively. For the dual-species biofilms with C. albicans and P. aeruginosa, 3.41- and 7.41-log10 CFU reduction were observed after 500 J/cm2 aBL exposure (P < 0.0001) (Table 2), indicating that 1.30- and 0.53-log10 CFU more inactivation of C. albicans and P. aeruginosa were achieved in the dual-species biofilms than in the monomicrobial ones. On the other hand, 2.61- and 3.67-log10 CFU reduction was obtained in MRSA (P < 0.0001) and P. aeruginosa (P < 0.0001), respectively, in the dual-species biofilms with the two species. In comparison to the monomicrobial biofilms of P. aeruginosa, aBL-induced reduction of P. aeruginosa decreased by 3.21-log10 CFU in the dual-species biofilms with MRSA and P. aeruginosa. In the case of MRSA, 0.26-log10 CFU more inactivation was observed in the polymicrobial biofilm with P. aeruginosa compared to the monomicrobial biofilm (Table 2). The temperature was measured in the 96-well microtiter plates during 405-aBL exposure (216 and 500 J/cm2). The highest temperature recorded was 37.5°C, at which no loss of the viability of any of the microorganisms was observed. When the monomicrobial biofilms of each species were established in the CDC biofilm reactor under a turbulent flow of nutrients for 48 h, the cell densities of the biofilms were 7.36 log10 CFU/cm2 for C. albicans, 9.23 log10 CFU/cm2 for P. aeruginosa and 6.83 log10 CFU/cm2 for MRSA (Table 3). When the dual-species biofilms with C. albicans and P. aeruginosa were grown in the CDC biofilm reactor for the same time period, the cell densities changed to 5.83 log10 CFU/cm2 for C. albicans and 8.07 log10 CFU/cm2 for P. aeruginosa (Table 3). For the 48-h old dual-species biofilms with MRSA and P. aeruginosa, the cell densities were 7.44- and 7.52-log10 CFU/cm2 for MRSA and P. aeruginosa, respectively (Table 3). Table 3. Antimicrobial blue light (405 nm) inactivation of biofilms grown in the CDC biofilm reactor after 48 h of incubation. When an aBL exposure of 216 J/cm2 had been delivered, 1.48- and 2.05-log10 CFU reduction were observed in P. aeruginosa and MRSA monomicrobial biofilms, respectively (ns, P > 0.05), while only minimal reduction of CFU was observed in C. albicans monomicrobial biofilms. When the aBL exposure was increased to 500 J/cm2, the aBL-induced inactivation of microorganisms in the respective monomicrobial biofilms were 1.04- (ns, P > 0.05), 2.58- (ns, P > 0.05) and 3.70-log10 CFU (P = 0.0017) for C. albicans, MRSA, and P. aeruginosa, respectively. When the two species of P. aeruginosa and C. albicans were incubated together and formed dual-species biofilms, 2.58-log10 CFU inactivation of P. aeruginosa and 1.71-log10 CFU inactivation of C. albicans were observed after treatment with 500 J/cm2 aBL (ns, P > 0.05). In the dual-species biofilms with MRSA and P. aeruginosa, aBL-induced reduction of CFU was 3.56- log10 and 0.86-log10 for P. aeruginosa (P = 0.0029) and MRSA (ns, P > 0.05), respectively. Confocal laser scanning microscopy images confirmed that both monomicrobial and polymicrobial biofilms were successfully established in the CDC reactor (Figure 1). In all the untreated monomicrobial biofilms, spontaneously dead microorganisms (as stained red with PI) were observed. This event became more prevalent in the dual-species biofilms with C. albicans and P. aeruginosa, where some C. albicans hyphae also dyed with PI in the untreated biofilms. After an exposure of 500 J/cm2 aBL, almost all the microbial cells in the biofilms appeared dead, as evidence by the red staining with PI in the CLSM images (Figure 1). Figure 1. Confocal laser microscope images showing the cytotoxic activity of aBL in P. aeruginosa IQ0046, MRSA USA300 and C. albicans CEC 749 mono and polymicrobial biofilms. Scale bars represent 10 or 100 μm. NT, no treatment; aBL, biofilm treated with 405-nm aBL (92.6 mW/cm2, 500 J/cm2). In the polymicrobial biofilms, ∗ indicate C. albicans CEC 749, solid white arrows indicate P. aeruginosa IQ0046 and dashed line arrows indicate MRSA USA300. Scanning electron microscopy images revealed that aBL induced morphological changes in both the monomicrobial and polymicrobial biofilms (Figures 2, 3). Untreated C. albicans and P. aeruginosa monomicrobial biofilms showed highly dense and compact microbial cells (Figure 2). Untreated MRSA monomicrobial biofilm, on the other hand, had a smaller biofilm density and the surface of the polycarbonate coupon could be easily observed (Figure 3). All monomicrobial biofilms were surrounded with extracellular polymeric substance (EPS). P. aeruginosa and MRSA seemed to have a larger amount of EPS than C. albicans. The EPS of P. aeruginosa was organized like a mesh while the EPS of MRSA appeared in a star-like fashion. C. albicans biofilm was composed of yeast and hyphal forms. Figure 2. Scanning electron microscope images showing the cytotoxic activity of aBL at 405 nm in P. aeruginosa IQ0046 and C. albicans CEC 749 monomicrobial and polymicrobial biofilms after an aBL exposure of 500 J/cm2 (92.6 mW/cm2 and 90 min). Scale bars represent 500, 20, or 2 μm. Figure 3. Scanning electron microscope images showing the bactericidal activity of aBL at 405 nm in P. aeruginosa IQ0046 and MRSA USA300 monomicrobial and dual-species microbial biofilms after an aBL exposure of 500 J/cm2 (92.6 mW/cm2 and 90 min). Scale bars represent 20 or 2 μm. After an aBL exposure of 500 J/cm2 the density of the microbial cells in the monomicrobial biofilms decreased in all three species. The cell density decrease in C. albicans and MRSA monomicrobial biofilms was better observed with × 100 or × 2.5 k magnification. For P. aeruginosa monomicrobial biofilm, on the other hand, the decrease of cell density after aBL treatment was much more evident under × 25.0 k magnification; although, they can also be observed in all the other magnifications. In agreement with the CLSM images, P. aeruginosa attached to the surface of C. albicans in the dual-species biofilm and formed a very dense biofilm with lower amount of EPS than observed in the monomicrobial biofilms. The effect of the aBL treatment on the P. aeruginosa and C. albicans dual-species biofilm could be observed in the decrease in microbial cell density under × 100 magnification for C. albicans and under × 25.0 k magnification for P. aeruginosa (Figure 2). The SEM images of the dual-species biofilm with MRSA and P. aeruginosa revealed that the two microorganisms are infiltrated together (Figure 3). Similar to the dual-species biofilm with C. albicans and P. aeruginosa, the cell density of the dual-species biofilm with MRSA and P. aeruginosa decreased after treatment with 500 J/cm2 aBL (92.6 MW/cm2 and 90 min) (× 2.5 k magnification). In addition, P. aeruginosa and MRSA dual-species biofilm had lower amount and thinner EPS than the monomicrobial biofilms (Figure 3). The temperature in the 35-mm petri dishes was measured during 405-aBL exposure (216 J/cm2 and 500 J/cm2). The highest temperature recorded was 33.1°C. The phototoxicity study of aBL showed no statistically significant loss of viability in HaCaT cells after an exposure of up to 216 J/cm2 (60 mW/cm2, 60 min) (P = 0.4016) (Figure 4). The exposure of HaCaT cells to 500 J/cm2 (92.6 mW/cm2, 90 min) reduced the metabolism of the cells significantly (P = 0.0011) to 49% of the unirradiated control (Figure 4). Figure 4. Cytotoxicity of 405-nm aBL to normal human HaCaT cells after an exposure of 216 J/cm2 (60 mW/cm2, 60 min) or 500 J/cm2 (92.6 mW/cm2, 90 min). 0 vs 216 J/cm2 (P = 0.4016) and 0 vs 500 J/cm2 (P = 0.0011). Bars are the SE. ∗∗P < 0.01. In this study, we investigated the efficacy of 405 nm aBL for the treatment of P. aeruginosa, MRSA, and C. albicans in monomicrobial and polymicrobial biofilms formed in 96-well microtiter plates and the CDC biofilm reactor. Our findings demonstrated that in 96-well microtiter plates both the monomicrobial and polymicrobial biofilms (either 24 or 48 h old) were highly susceptible to 405 nm aBL. When the biofilms were developed in the CDC biofilm reactor, they exhibited higher tolerance to aBL. A possible reason for that result is the increased thickness of the biofilms obtained in the CDC biofilm reactor. Both techniques used in this study have their advantages and limitations. Microtiter plates are high-throughput and inexpensive but they suffer an exhaustion of nutrients and loosely attached biofilm can be detached during washing steps. The CDC biofilm reactor, on the other hand, is low-throughput and requires special equipment, but in this case, biofilms are grown with continuous supply of fresh medium and under shear stress (Azeredo et al., 2017), which is more clinically relevant. Hydrodynamics have major impact on biofilm growth, and biofilms grown under higher concentrations of nutrients and higher shear stress will be more abundant, filamentous and have higher cell density and thicker and more complex EPS. Those grown under lower nutrient concentrations and lower shear stress will be more compact with a lower cell density of a single layer of microcolonies and have thinner EPS. In addition, an open biofilm structure in the CDC biofilm reactor will facilitate the diffusion of nutrients easier than in the compact structure (Molobela and Ilunga, 2011). Under most of the conditions, the CFU reduction by aBL in the C. albicans and P. aeruginosa dual-species biofilms was higher than that in the respective monomicrobial biofilms. Conversely, the CFU reduction by aBL obtained in the dual-species biofilms with MRSA and P. aeruginosa was less than that obtained in the respective monomicrobial biofilms. This seemed to be in relation with the different kind of interactions between these specific pathogens. The results from the present study showed that an antagonistic interaction between C. albicans and P. aeruginosa in the dual-species biofilms favored aBL inactivation and a synergistic interaction between MRSA and P. aeruginosa appeared to hinder aBL inactivation. To the best of our knowledge, this study is the first to investigate the activity of aBL at 405 nm against biofilms using the in vitro dynamic biofilm model CDC reactor and the effect of aBL at 405 nm against dual-species biofilms with P. aeruginosa and MRSA as well as with P. aeruginosa and C. albicans. Other polymicrobial biofilms where aBL has been tested include dual-species biofilms formed by E. coli and S. aureus, in which 1.2 and 1.7 log10 CFU/mL inactivation were obtained, respectively, after 254.66 J/cm2 aBL at 405 nm was delivered (McKenzie et al., 2013) and in vivo human periodontal polymicrobial biofilms, in which an inactivation of 0.25 and 0.56 log10 CFU/mL in Porphyromonas gingivalis and Prevotella intermedia was obtained, respectively, after 8.45 J/cm2 aBL at 455 nm was delivered daily for 4 days (Soukos et al., 2015). In addition, a previous study showed that, after an exposure of 540 J/cm2 at 415 nm, no apoptotic cells developed in aBL-irradiated mouse skin (Wang et al., 2016). 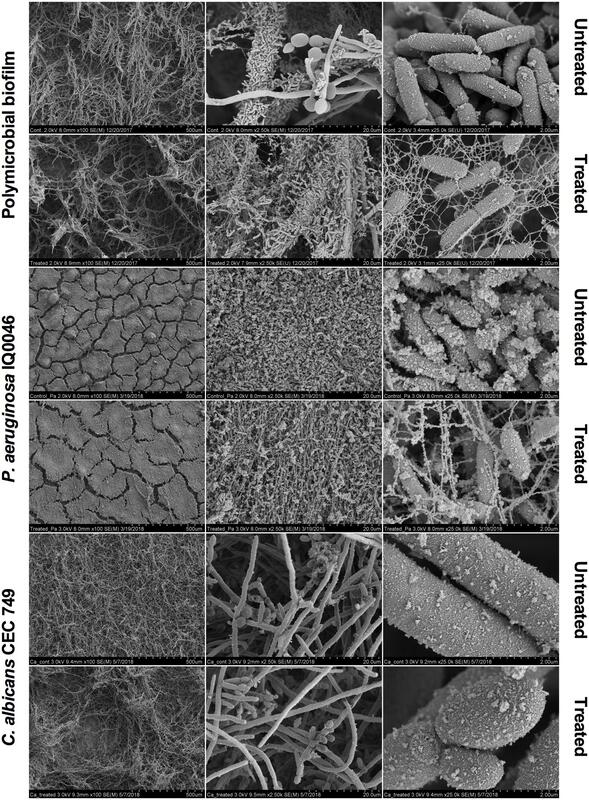 The results presented in the CLSM (Figure 1) and SEM (Figures 2, 3) images as well as the cell densities of the monomicrobial and polymicrobial biofilms observed in the microtiter plates (Tables 1, 2) and in the CDC biofilm reactor (Table 3) demonstrate the interactions between different microbial species in the polymicrobial biofilms. As described previously, P. aeruginosa formed its biofilm in the hyphae of C. albicans and as a result of that association, the hyphae of the fungus are damaged (Peleg et al., 2010). This resulted in reduced number of C. albicans CFU after 48 h of incubation with P. aeruginosa (Tables 2, 3). In addition, the susceptibility of C. albicans to aBL increased in dual-species biofilms probably due to a synergistic effect with the damage to C. albicans cells induced by P. aeruginosa. On the other hand, the SEM images of the dual-species biofilms with MRSA and P. aeruginosa revealed that the two microorganisms are infiltrated together (Figure 3). The interaction between the two species seems to be synergistic as P. aeruginosa promotes MRSA adherence to the substrate in the turbulent environment of the CDC reactor. This is evidenced by the increase in MRSA cell density in the dual-species biofilms in comparison to the monomicrobial biofilm, and the decrease in EPS production observed in the SEM images (Table 3 and Figure 3). In addition, the tolerance of P. aeruginosa to aBL treatment increased when cocultured with MRSA. This can be attributed to the production of carotenoid pigments by MRSA, which are known to physically quench singlet oxygen and to protect bacteria from the lethal effects of aBL (Dahl et al., 1989; Glaeser et al., 2011). As was reported in previous studies (Murdoch et al., 2013), aBL inactivation of microorganisms is oxygen dependent. Oxygen availability can be a concern in biofilms as actively respiring aerobic microcolonies can consume oxygen faster than oxygen diffusion, which results in the formation of anaerobic zones in the deep layers in the deep layers of the biofilm (Flemming et al., 2016). This explains the finding in the present study that the biofilms grown in the CDC biofilm reactor are more tolerant to aBL inactivation than the biofilms grown in the 96-well microplates. As the biofilms obtained in the CDC biofilm reactor are thicker than the biofilms grown in the 96-well microplates, oxygen availability has a bigger impact on them. A potential way to increase the effectiveness of aBL inactivation of biofilms is to combine aBL with hyperbaric oxygen therapy. It was reported that hyperbaric oxygen therapy, in which the air pressure is several times higher than normal air pressure, could increase oxygen diffusion depth in biofilms and, subsequently, facilitate ciprofloxacin killing (Gade et al., 2018). As shown in Tables 1, 2, an aBL exposure of 216 J/cm2 reduced the viability of the polymicrobial biofilms very significantly. In contrast, the phototoxicity study of aBL showed no statistically significant loss of viability in HaCaT cells after an exposure of up to 216 J/cm2 (Figure 4). 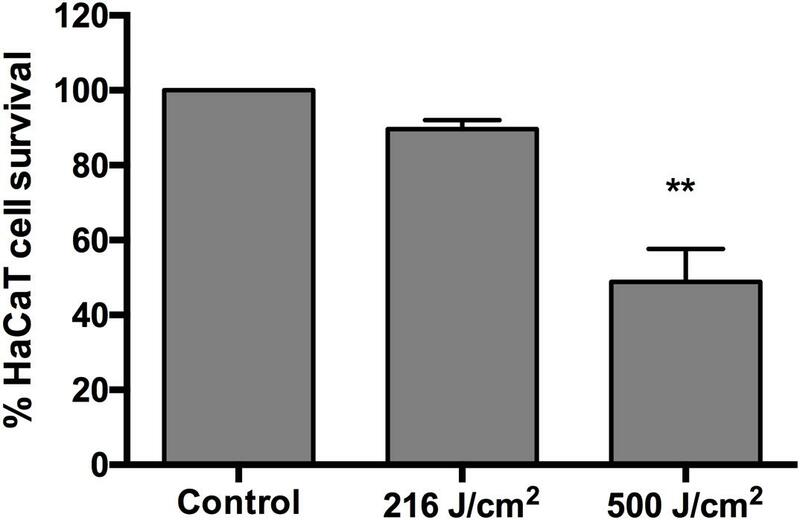 Significant cytotoxicity was observed in the HaCaT cells after an exposure of 500 J/cm2 aBL. The antimicrobial effect of aBL could be further improved synergizing its activity with a photosensitizer or antibiotic treatment. A synergistic combination could allow a decrease in the exposure time and radiant exposure, reducing the phototoxicity to the host cells and widening the therapeutic window of aBL. The results obtained in the present study indicate the promising efficacy of aBL inactivation of polymicrobial biofilms, for treatment of infections in which multiple antimicrobials are usually required in order to eradicate different microbial species. 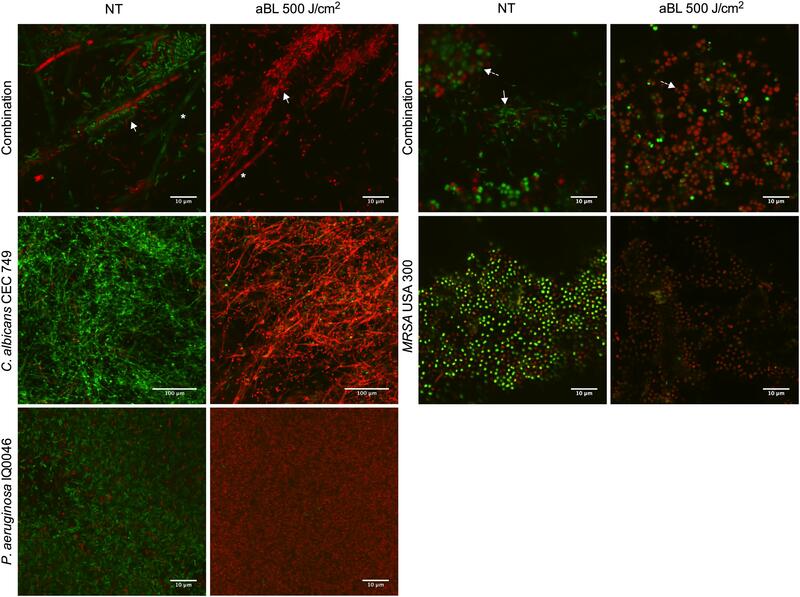 Future studies are warranted to investigate other important biofilm-forming microbial species, the strategies to enhance the effectiveness of aBL, and aBL treatment of polymicrobial biofilms-related infections in vivo. RF-E, and TD designed the study. RF-E, XL, and XG performed the experiments. RF-E and TD analyzed the data and wrote the manuscript. This study was supported in part by the National Institutes of Health (R01AI123312 to TD) and the United States Department of Defense (FA9550-16-1-0479 to TD). We would like to acknowledge William Fowle for his directions in preparing the SEM samples and Bin Zheng, Ph.D. for providing us the HaCaT cells. Clinical, and Laboratory Standards Institute (2002). Reference Method for Broth Dilution Antifungal Susceptibility Testing of Yeasts; Approved Standard, 2nd Edn. Wayne, PA: Clinical and Laboratory Standards Institute. Clinical, and Laboratory Standards Institute (2011). Performance Standards for Antimicrobial Susceptibility Testing: Twenty-First Informational Supplement M100-S21. Wayne, PA: CLSI. Copyright © 2019 Ferrer-Espada, Liu, Goh and Dai. This is an open-access article distributed under the terms of the Creative Commons Attribution License (CC BY). The use, distribution or reproduction in other forums is permitted, provided the original author(s) and the copyright owner(s) are credited and that the original publication in this journal is cited, in accordance with accepted academic practice. No use, distribution or reproduction is permitted which does not comply with these terms.